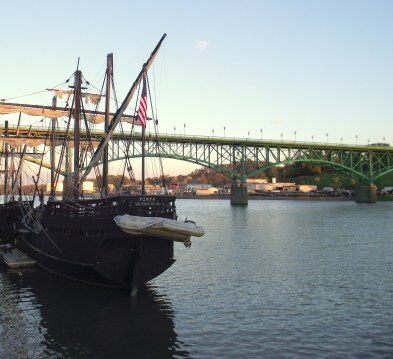 Replicas of Columbus' sailing ships the Nina and Pinta are in dock in Knoxville at Calhoun's on the River. 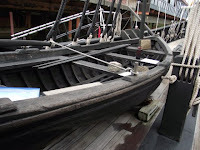 From now through November 17, 2010 visitors can tour these ships and learn about history. The cost is $7 for adults, $6 for seniors, $5 for students and free for kids under age 4. This author was able to visit on opening day. It was rainy, wet and cold but that didn't dampen my enthusiasm. Crowds were few so it was the perfect for talking with the crew about the ships. They are knowledgeable and enjoyed sharing the the history of the original and replica Nina and Pinta. Both ships are made to replicate the Spanish caravel sailing ships. When kids think of a pirate ship this type of vessel springs to mind. Walking aboard a "pirate ship" isn't something kids get to do everyday. The few who were there seemed to be enjoying themselves. Sorry though, climbing on the rigging of the replica Nina and Pinta is not allowed. I was delighted to learn how historical the Nina actually is. Archaeology Magazine dubbed her "the most historically accurate 15th century ship ever built". The crew member said acuracy was so important that no powered tools were used to create her. We also learned that a supply boat on board the Nina was built by a 14 year old in Brazil. It was part of his apprenticeship to make the boat. Completion took a year and it is also historically accurate. After Knoxville, the Nina and Pinta will travel to Columbus, Mississippi. Find out the full scoop about their stay in the City of Knoxville and other voyages at www.nina.com. If you get the chance to go, do so. They won't be back in Knoxville for three years.